Oman Sail is a new initiative which aims to promote and develop sailing in the country and restore some of the nation’s maritime heritage. Starting at the top, a team of international sailors has been established which will eventually include more Omanis to compete at national, international and Olympic levels. 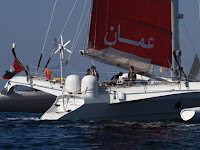 The organisation has purchased Ellen MacArthur’s trimaran which recently sailed from the UK to Muscat. Renamed ‘Musandam’, its next trip will be a little longer – non-stop round the world. On a beatifully sunny day, we headed out to sea with friends from the Bandar Ar Rawda marina to wait for the impressive looking craft which crept out just before two o’clock. 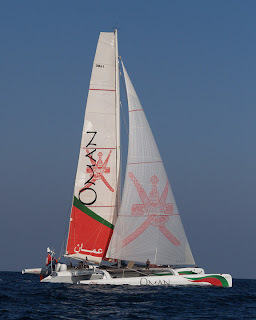 A flotilla of small boats bob bed along behind Musandam while the five-man crew (including one Omani) tinkered on deck. We wondered what it must have been like for Ellen MacArthur to have been on her own at the top of the 30m mast in high seas. After half an hour the boat finally turned eastwards to start the journey towards Australia. They should return in 80 – 100 days. We wish them luck. Yes it was a lovely afternoon, I did enjoy it despite my facial expressions when it got rough!Your photos are good - how did you manage to hold the camera that still? !